My wife (ie - singing up for her) has a bunch more, but that isn't relevant here. Spouses are completely separate when it comes to credit cards and credit card bonuses. Before any applications it's important to analyze the cards you have between yourself and your spouse to see if there are any glaring holes. I haven't shown you all of our cards, but I can think of one. Neither of us has a Chase Business card. Chase business cards get you 5% cashback at office supply stores (staples, etc. ), cable, phone and internet. Therefore, this will definitely be one of the cards I apply for. Once you have plugged every hole, you can start apply for cards based on sign up bonuses. 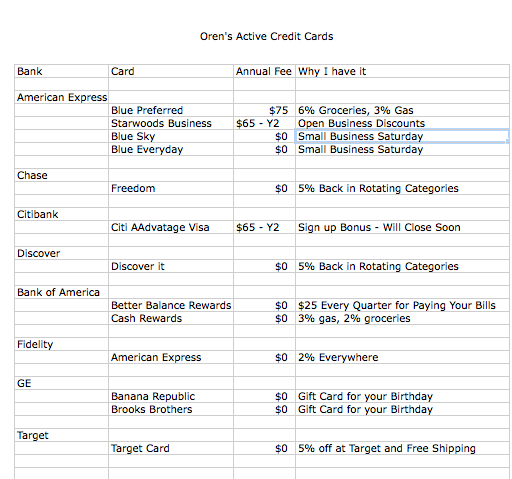 Every 6 months (see part 1), if they have a good bonus, I tend to apply for one card from each major credit card company: Chase, Amex and Citibank. One business card and one personal card is ok too. I usually apply for one more card as well, but not necessarily. Chase Ink Bold - Currently 50,000, but I hope to be matched to the 60,000 bonus offer. I chose the Ink Bold over the Ink Plus even though they have the same sign up offer because the Ink Bold is a charge card and Ink Plus is a credit card. A charge card must be paid in full each month while you can carry a balance on a credit card. This allows me to tell Chase when I apply to the credit card that I want this card because it allows me to carry a balance so that I can get both sign up bonuses. Citibank AA Mastercard/Barclays US Airways - American Airlines and US Airways are set to merge this year and their miles will combine. This is one of the last opportunites to double dip by getting both US airways and American airlines miles. Barclays NFL - I can't decide between this one and the US Airways. I am leaning toward the NFL because I like cold, hard cash. Also, the US Airways card has an annual fee that isn't waived the first year. PenFed - Penfed cards can be hard to get, but the rewards are good. 5% back on Airline purchases. 115,000 Chase Ultimate Rewards Points. 80,000 points is free round trip to Israel (I always measure in terms of trips to Israel because that is my ultimate plan on how to use most of these points). 90,000 AA points get you to Israel. 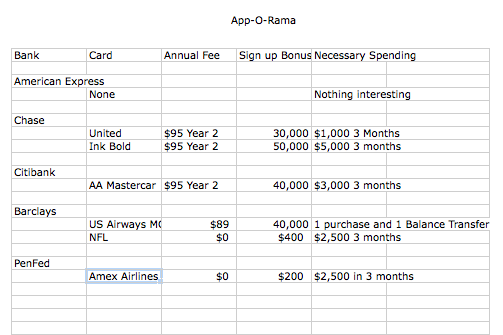 Assuming I go for the NFL card and not the US Airways card, I will need to spend $15,000 in 3 months. This would basically be impossible without Vanilla Reload cards and Bluebird, but not terribly difficult with them. Learn more about Bluebird and Vanilla Reloads here. Find any VRs in the 07666? Yes, but I have only been there once. I want to make sure that it is consistently there before I publish the location. I don't want to disappoint anyone. FYI, happened to be in neighborhood today. Got lucky at third store, which was on different street as other two - v'hamayvin yavin.